Bristol is located in the Blue Ridge Highlands region of Virginia and lies directly on the Virginia/Tennessee state line. Washington County surrounds the city. Known as "The Birthplace of Country Music," Bristol was the location of the first country music recordings made for national distribution. And in 1998, Congress made it official! Today, country music murals and monuments line Bristol's State Street. The new Birthplace of Country Music Museum provides a forum for live performances and also features collections of musical instruments and memorabilia from country music legends Lester Flatt, Earl Scruggs and Tennessee Ernie Ford, born on the Tennessee side of the street! 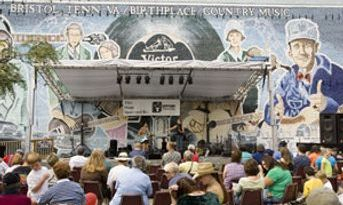 Bristol is a major city along The Crooked Road: Virginia's Heritage Music Trail. NASCAR fans love Bristol International Speedway (actually on the Tennessee side)! And baseball fans can enjoy theBristol White Sox, Advanced Rookie Team with the Chicago White Sox, who play at DeVault Memorial Stadium off I-81. The Bristol Parks and Recreation Department operates 15 parks and two 650-acre recreational areas for horseback riding, hiking and wildlife watching. The Bristol and Appalachian Caverns are other sites not to be missed. For the Ultimate Harley-Davidson® Experience, we invite you to Black Wolf H-D® the largest Harley-Davidson® motorcycle dealership in the Mountain Empire, with over 40,000 square feet located just off I-81, exit 5 in Bristol, VA.
We maintain the largest selection of New and Used Harley-Davidson® motorcycles in the area, and offer a full array of financing options - Our professional sales staff is ready to make your dream a reality! We have an extensive selection of MotorClothes®, Parts and Accessories along with highly trained employees ready to assist you with the proper riding gear, latest styles, and customization of your Harley®. At our state of the art Service Department, our Harley® Certified Technicians have over 40 years of combined experience and will keep your Harley-Davidson® motorcycle ready for your riding enjoyment for years to come. 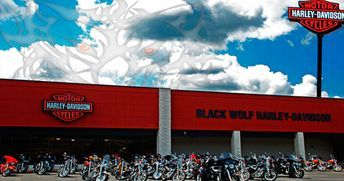 Black Wolf H-D® is conveniently located near the areas of Bristol, Kingsport TN, Johnson City TN, Aberdeen West Virginia, and Gate City, Virginia.